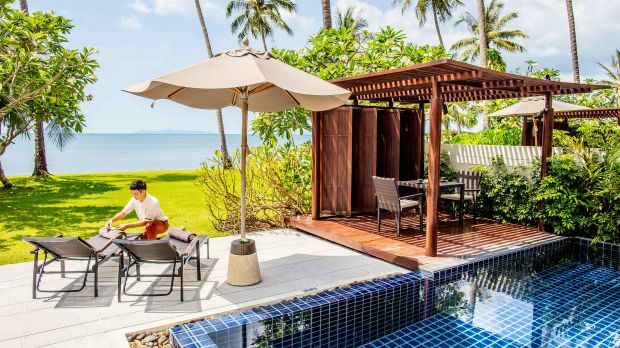 Envoyer une demande de disponibilité comprenant vos dates de voyage à InterContinental Samui Baan Taling Ngam Resort. This room offers direct access to incredible seafront vistas. Features include an incredible vantage point over the sparkling sapphire waters and white sandy beaches of Taling Ngam Bay. White paneled doors open out onto spacious balconies, where a large daybed and dining area provide the perfect place for you to sit back and soak up the truly amazing view and sunsets. 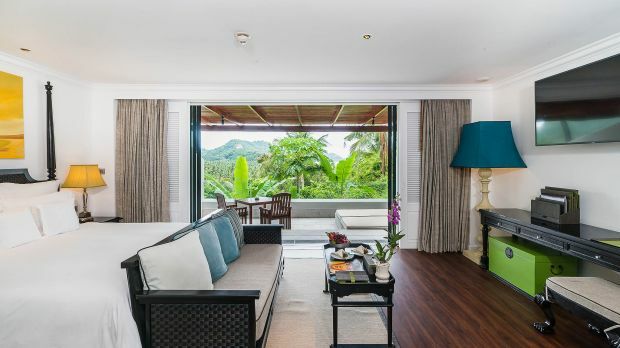 A roomy 65-square meter interior features the high, vaulted roofs common to southern Thailand, and is outfitted in the Resort’s signature blend of plantation style furnishings and Thai décor. Our stylish and spacious Resort Classic Rooms offer you the comfort needed for a relaxing holiday break. You may catch the tropical sunset from your oversized private balcony complete with a large daybed and dining area. Inside, you’ll have space to stretch out and relax in your 65-square meter room. Tropical plantation-style white walls and dark wood furnishings are highlighted with lovely splashes of Thai color and beach-inspired art and accents. The bathroom includes a double vanity, separate bathtub and shower and exclusive bathroom amenities and essential oils. Features a spacious yet secured balcony with views over the sea and the coconut plantations, tropical Survival Kits (Pore cleanser and mosquito repellent), hair dryer, refrigerated private bar, tea/coffee maker, in-room safe, kids' amenities such as children-sized bathrobes and slippers and free access to Planet Trekkers Kids Club. Features 1 King bed and panoramic ocean views. Features 1 King bed, club access and ocean view. Located on the ground level of our cliff side villas, the 70-square meter Club Tropical Pavilion Suites are private havens set among a lush jungle backdrop. Exquisite plantation-style dark wood furniture and white walls are complemented by neutral color tones, Thai accents and splashes of color, while unique detailing, upgraded amenities and a private bar serve to heighten the sense of luxury. The bathroom comes with separate bathtub and shower with vanity as well as an adjoining private dressing area. Outside, a spacious private terrace provides easy access to one of the Resort's five color-coded pools. 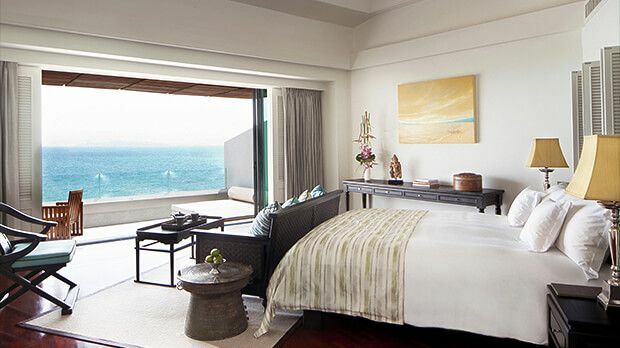 Ideal for honeymooners and romantic getaways, the 120-square meter Club Ocean View Terrace Suite feature dreamy four-poster beds and luxurious ambience in a space with an extended terrace, perfect for outdoor entertainment. Unlike any other accommodation on the island, these 120-square meter suites are the ideal setting for a romantic getaway. Bold columns in orchid purple rise towards the vaulted ceiling, forming a unique four-poster bed draped with curtains and backed by towering latticework. Elegant furnishings, creative lighting and decor heighten the ambience. Your private deck serves as an intimate spot to share a sunset together, watching the passionate display of colors over the evening ocean. A luxurious bathroom with adjoining dressing area also graces the suite. 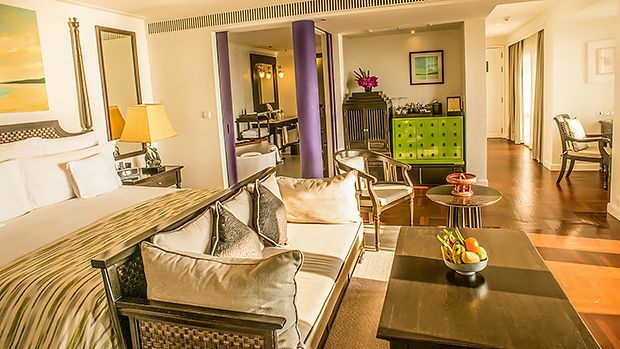 This large suite features a Jacuzzi for long, relaxing soaks, 147-square-meter space and wide-open views of the Gulf of Thailand's scenic beauty. The terrace invites you to linger with gorgeous daybeds and a dining area for an al fresco candle light dinner or sundowner in the privacy of your suite. 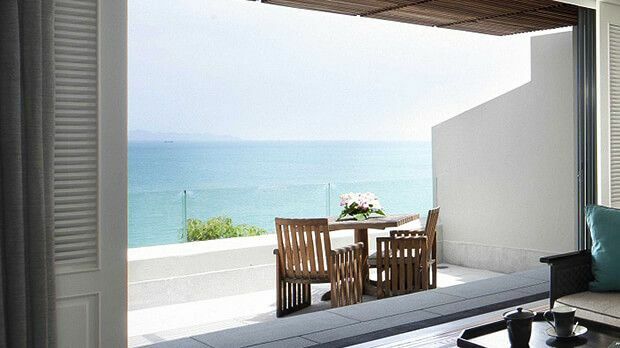 Perched on Taling Ngam’s famous cliffside setting, the Club Panoramic Ocean View Suite offer up some of Samui's most sensational views that might be enjoyed from your own private Jacuzzi. Inside, crisp white walls and dark wood blend with comfortable contemporary furnishings, beach-inspired art and colorful Thai accents. Wooden-shuttered wraparound windows offer views of the iconic Five Islands and sparkling sea directly from an indulgent deep-soak tub. The bathroom also features a separate shower, double vanity and an adjoining private dressing area. Our Club InterContinental Beachfront Pool Villa offer immaculate indoor and outdoor living areas in a lavish sense of space. 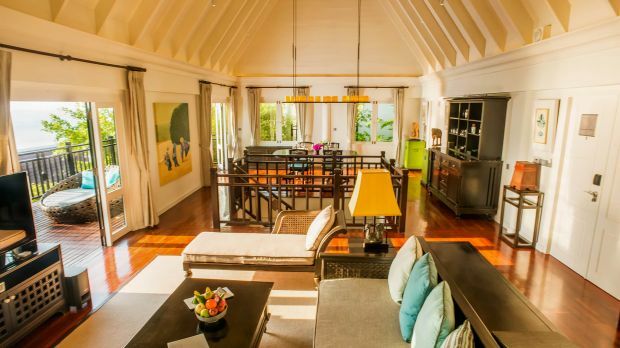 High vaulted ceilings rise over the villa’s plantation-style furnishings and contemporary Thai décor. Inside, enjoy a king-size bed, indulgent spa bath and private bar. 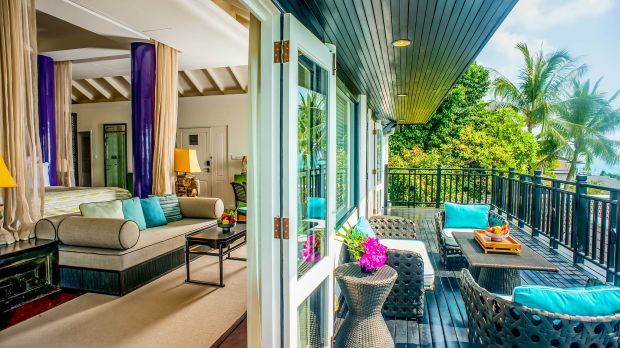 Outside, relax on your private sundeck with personal pool and shaded pavilion surrounded by colorful tropical gardens. Club InterContinental® guests are entitled to special privileges and benefits that include exclusive access to the elegant complimentary afternoon tea, unlimited soft drinks from the in-room mini bar as well as an evening cocktail and canapés. Club guests can also enjoy Internet access, our 24-hour personalised Butler Service and Virtual Butler Service, and complimentary Breakfast in Amber or in Club InterContinental Beachfront Pool Villa. Our Club Two-Bedroom Residence Villa are perfect for families or friends, with a cliffside setting among verdant jungle greenery and the tropical surroundings. Enjoy an extravagant 240 sqm of space with luxurious interiors and enormous terraces in your island home away from home. On the Villa’s upper level, you’ll find an inviting living and dining space underneath enormous high-vaulted Thai ceilings. Modern Thai design meets the white walls and dark wood of tropical plantation style, highlighted with accents such as canopied lighting and candle arrangements. Two en-suite bedrooms await below with comforts such as pillow menus and charming beach-inspired watercolors and accents. Each villa offers access to one of the resort's five vibrantly colored swimming pools just steps away. Club InterContinental® guests are entitled to special privileges and benefits that include exclusive access to the elegant complimentary afternoon tea, unlimited soft drinks from the in-room mini bar as well as an evening cocktail and canapés. Club guests can also enjoy Internet access, our 24-hour personalised Butler Service and Virtual Butler Service, and complimentary Breakfast in Amber or in Club Two-Bedroom Residence Villa.